Help us preserve these historical buildings for future generations of visitors to Pocahontas State Park. The Civilian Conservation Corps (CCC) was a public work relief program that operated from 1933 to 1942 in the United States for unemployed, unmarried men. The land that would eventually become Pocahontas State Park was developed by these young men in the 1930's. Many of the cabins and buildings around the park built by these young men have fallen into disrepair. These building are now apart of the National Register of Historic Places. We have made it our mission to preserve these buildings for future generations of park visitors to enjoy. Volunteers are actively engaged in working to stabilize the Civilian Conservation Corps built group cabins. As there are five remaining group cabin sites, each with 6-8 cabins along with supporting structures, this is a large and time consuming effort. It is expected to take several years. Cabin Work Week was launched in 2018 as a way to bring focus to the preservation effort. Fifteen volunteer RV's were invited to participate. They would receive a complimentary campsite for one week in exchange for working on the cabins. This effort proved invaluable (see Cabin Work Week 2018 for more information). As Cabin Work Week approached, a few local volunteers were solicited to help prepare for the large number of volunteers that were planning to come to the park. Ahead of time, they became familiar with the project and performed advance work so that when the project started, it would become immediately productive. This approach proved extremely worthwhile and as it turns out, closely matches the actual CCC's use of Locally Employed Men (LEMs). 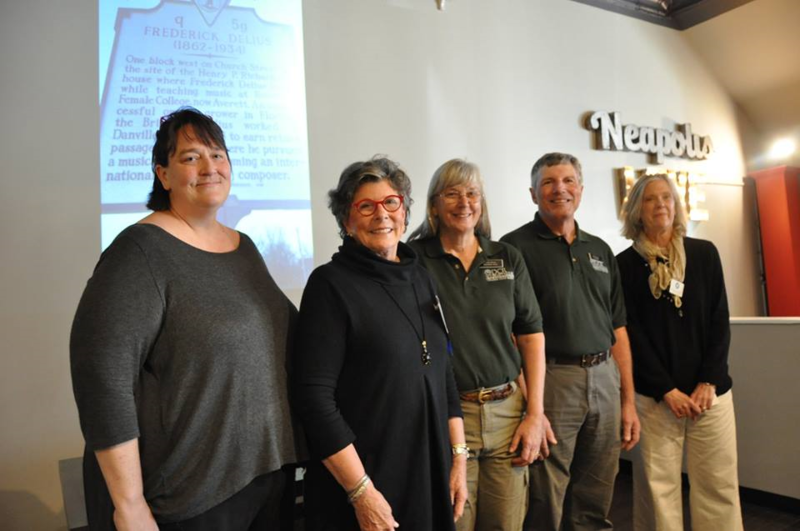 Virginia Preservation holds an annual preservation conference that brings together architects, builders, preservationists, government leaders, developers, lawyers, local planning officials and everyday citizens to explore preservation ideas and initiatives. As part of the conference, they invite preservation projects to submit a "Pitch" and award the winner $2,000 to help fund the project. 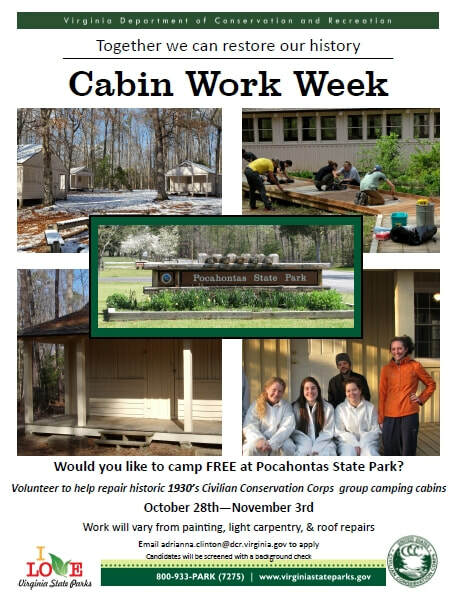 This year's winner was Pocahontas State Park's Cabin Work Week project. Our first Cabin Work Week was a success. Thanks to everyone who was able to come out and help. Here is a short video showcasing some of the hard work done to start the process of preserving the CCC Cabins at Pocahontas State Park. Cabin Work Week 2019 has been announced. Due to the success of our first Cabin Work Week, the project has been expanded to two weeks. Participants are welcome to sign up for either or both weeks. The dates are: October 27, 2019 - November 11, 2019.